The LCN-GT12 is a sensor-touch panel with a bargraph display. It is connected to the mounting panel and a standard double flush mounted wall-box and firmly fixed with 2 sliding hooks. It connects to the T-Port of any LCN modules. The integrated temperature sensor allows the user to control the temperature. The 12 capacitive working sensor surfaces are located behind a 5mm glass front. A light touch of the glass front is all that is needed to trigger the different functions. The intelligent control distinguishes between ‘Hit, Hold and Release’ so that 3 commands are possible for every key. A LED which is integrated into every sensor indicates the current status of any actuator or sensor in the building using four indicator modes. 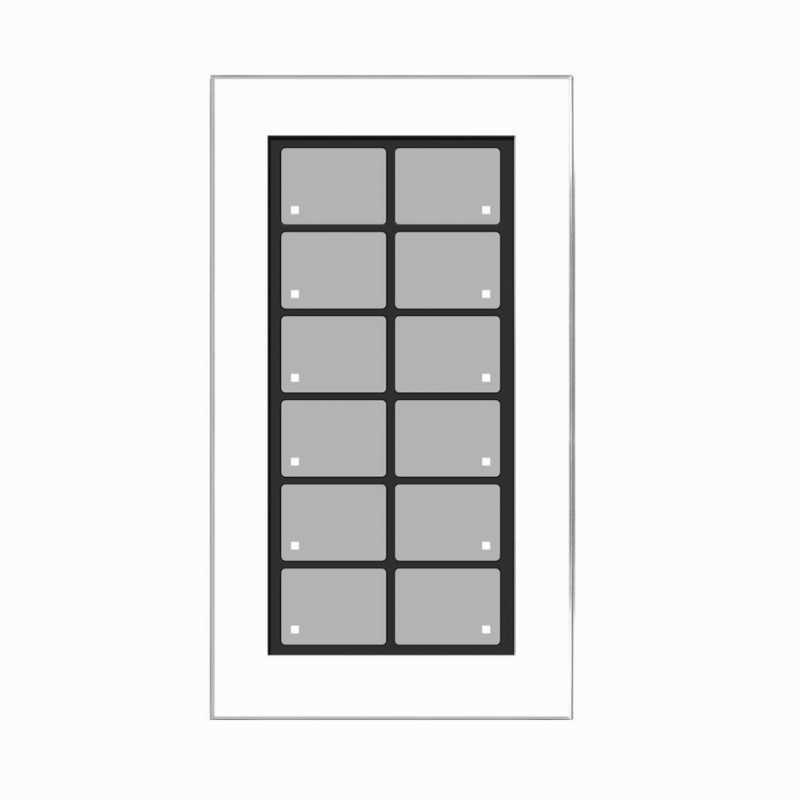 The touch panel sensor pads can be labelled individually and changed easily. Background illumination on the sensors (optional) allows the LCN-GT12 to be used comfortably with low room lighting. The 15 digit bargraph display enables analogue ACTUAL and DESIRED values to be displayed. The individual labels for the LCN-GT12 are printed on foil/membrane or paper, and fitted behind the glass front through a small slot. The labelling can be changed at anytime so that changes to the key functions do not create a problem. Easy to understand symbols and templates come delivered with the LCN-GT12. The LCN-GT12 is for mounting in interior dry rooms. It can be used for every switch, regulator and control function within the LCN bus system. It is especially suited to the design orientated user who demands high performance and comfort.